If I were knowingly heading into an active theatre of war, I like to think I would go armed with the necessary information, wardrobe, and exit plan (I’m a desperate coward). What I would never have thought to put on my packing list are a valet, a parrot, and a little black book with the names of seemingly everyone interesting, exciting and important. Hermione Ranfurly had all these things and more with her when she followed her husband, Dan, to the Middle East at the beginning of World War Two. Dan was fighting Germans, Hermione was fighting the British military for the right to stay near her husband, and Dan’s valet, Whitaker, was fighting to keep as much order as is possible in a) a war zone and b) a desert. 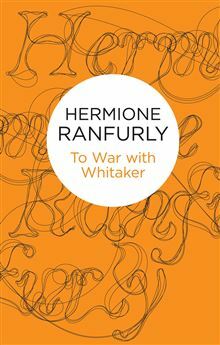 Hermione’s diaries of these days, collected in the excellently-named To War with Whitaker, make for wonderful reading and offer a perspective on that war that is certainly unlike any I’ve come across before and all the more welcome for that. Read my full review at Shiny New Books. I was so glad to find this in Open Library. Read this many years ago and really enjoyed it. Not content with having read it at the library, I had to have my own copy. I went on to order “Hermione,” her diaries from 1945 to 2001 — a fine mix of serious thought, empathy and generosity, and delightful domestic detail. And the proceeds go to the charities she set up: the Ranfurly Home for Children in the Bahamas, Book Aid International, and the Ranfurly Library Service in Australia. Next stop, her memoir of childhood, “The Ugly One”!